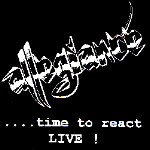 Allegiance > ...Time to React LIVE! There are no reviews for ...Time to React LIVE! yet. You can write one. Recorded live at the Triple JJJ Studios in Perth, Western Australia on the 17th of December 1994.